I still remember the first time I visited Domaine Leroy. It was the summer of 2007. One of my best friends from business school was getting married in Paris, which made for the perfect opportunity to spend a few days in Burgundy beforehand. It was a much earlier time in my tasting and writing career. Quite honestly, I was so looking forward to this visit that I had a hard time going to sleep the night before. A few years prior I had tasted a number of the 1993 Grand Crus, and the wines had remained etched in my mind ever since. As I walked into the understated winery in Vosne-Romanée I noticed the walls covered with photographs of what looked like incredible tastings. Gently softened by the passage of time, those photos bore testament to the extraordinary legacy built by Lalou Bize-Leroy and her late husband, Marcel Bize, over the six decades they spent together. My mind wandered as I imagined what it might be like to attend one of those events. 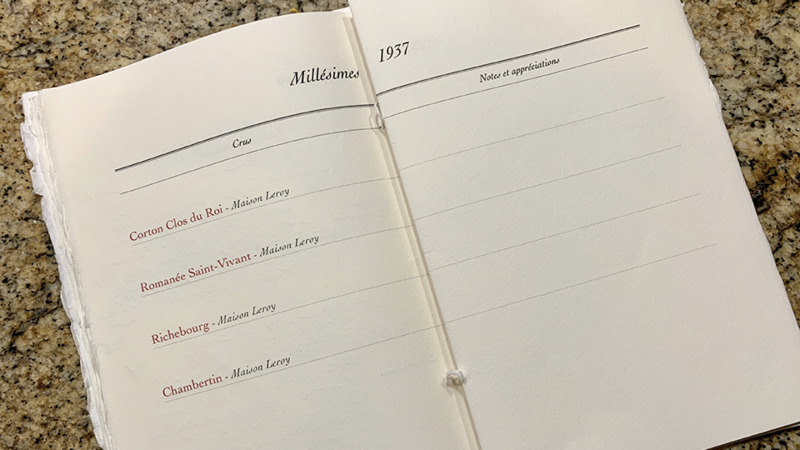 Little did I know that in the coming years I would have the opportunity to participate in several historic tastings at both Domaine Leroy and Domaine d’Auvenay, Lalou Bize-Leroy’s home estate in the hills outside Meursault. Known simply as ‘Lalou’, Mme Bize-Leroy remains one of the most towering figures in the world of wine. Readers who want to learn more about her extraordinary career may wish to revisit this article from a few years ago. Very rarely do I accept invitations to large-scale tastings at estates. Most of these affairs are either very clearly marketing events or parties, both of which I find insufferably boring and of absolutely no interest. But Mme Bize-Leroy’s tastings are always different because they are above all else historic. Would you like to know what was the most remarkable thing about this particular day? To me it was that Lalou did not make a single comment to the assembled group of about 40 people. She walked around to each table of four, as she always does on such occasions, and chatted with her guests, but there were no speeches, no prepared comments and no discussion of the wines. Each taster was taken to their assigned seat and given four glasses. From there, trusted long-term colleagues Frédéric Roemer and Gilles A.C. poured the wines in flights without any fanfare or ceremony at all. It was all about the wines. And only the wines. I asked Lalou how she put together the program. After all, she has a remarkable cellar of older vintages that is without equal in Burgundy, or possibly anywhere, for that matter. Knowing her attention to detail, I can only wonder how many bottles were opened in advance to check their suitability for this tasting. I am sure it was not just a few, as Lalou Bize-Leroy is not someone who leaves even the slightest detail to chance. “Well, I wanted to start with 2010, which is, in my view, a great vintage,” she allowed. “Then, I wanted to see what I had that I could serve across the same vineyards from 1999 and 1949, to cover two other great years, and then finish with 1937 for the reds and 1945 for the whites,” she added with a disarming casualness, as if she were describing every day wines one might have lying around the house. That informality is one of the most precious qualities that still remains in present-day Burgundian culture, at least among the older generation. It is a sense of simplicity linked to artisan roots from a time not that long ago when these wines weren’t the objects of speculation and rabid desire they are today. I consider myself very fortunate to have been able to witness this era, as I am not sure how much of that will be left for future generations to see. In theory, the tasting was conceived to mark Leroy’s 150th anniversary and 30th year of practicing biodynamic farming, the latter of which dates to a time when biodynamics and the broader theme of sustainability in viticulture were in their infancy rather than the widely adopted concepts they are today, but there was no mention of either milestone. Guests were drawn across a number of fields and included the owner of one of the most prestigious châteaux in Bordeaux, one of France’s most celebrated athletes, several renowned chefs, a few sommeliers, a handful of writers, a small group from Takashimaya, the Japanese department store is a part-owner of Domaine Leroy, a few people with close personal ties, and a prince whose security detail bumped me off my normal table at the Bistro de l’Hôtel de Beaune the night before, which was rather humorous. And that was it. The 2010 and 1999 wines were all domaine bottlings, either from Domaine Leroy or Domaine d’Auvenay, while the older vintages were all from Maison Leroy, the family’s négociant label. Over the years, I have had the opportunity to taste and drink many older Leroy reds, both at the domaine and in other settings, so I can’t say I was entirely surprised with how the wines showed. But I have far less experience with older Leroy whites, and that is where I was really captivated. When they are young, the Leroy and d’Auvenay whites are often very hard to read because they are heavily reduced. The 2010s are just now at the stage where reduction has begun to dissipate. Going back another eleven years, 1999 shows a set of whites that is just starting to be fully expressive. At a time when consumers are terrified to hold their white Burgundies for more than just a few years, Lalou Bize-Leroy makes whites that start drinking well at age twenty. As for the 1949s and 1945s, well, those wines are pure magic. In 2014, Bize-Leroy served me a 1964 Meursault Genevrières that is still one of the greatest wines, white or red, that I have ever tasted. “I am not sure why people are in such a rush today!” she exclaimed with that impassioned tone of hers that always makes me feel that she is slightly (or maybe not so slightly) annoyed. “Wines need time. The 1964s are only now truly ready to drink,” she told me that day. Who was I to argue? I hadn’t even been born when that 1964 Genevrières was made or when Bize-Leroy selected it for the Maison Leroy range. For all of her achievements, Lalou Bize-Leroy remains a controversial figure in Burgundy. Some of her colleagues resent her resounding success and unapologetically brash, outspoken personality. Others shudder at the staggering prices her wines command in the market and a level of scarcity that means very few people ever have chance to taste them. But everyone looks to see what she is doing in the vineyards. The reality is that Mme Bize-Leroy crafts wines unlike any others. Her reds are often spellbinding, while her whites are perhaps even more ageworthy. Quite simply, the wine world needs more, not fewer, eloquent, strong voices. Lalou Bize-Leroy embodies many ideals, but she is without question still Burgundy’s greatest exponent of the region’s most essential concept: terroir. In other words, the idea that a wine, first and foremost, must express a sense of place. The tasting starts with six 2010s; Corton Renardes, Romanée Saint-Vivant, Richebourg, Bonnes Mares, Mazis Chambertin and Chambertin. I admit I have always had a thing for 2010. It is my daughter’s birthyear, and also a vintage I tasted here from barrel and then bottle when I was at The Wine Advocate. The wines have always been marked by extraordinary purity, energy and structure. Back then, the 2010 Mazis was a wine that left me weak at the knees. It is every bit as viscerally thrilling today. The Chambertin is another star in this first flight. A wine with no beginning and no end, the Chambertin is outrageously beautiful. The Corton Renardes is another wine that is positively brilliant. Although it doesn’t have the supposed breeding of the crus of the Côtes de Nuits, the Corton Renardes is a wine I often appreciate for its structure and power. There is plenty of that today. Lalou repeats the same wines from 2010 with the 1999 flight; Corton Renardes, Romanée Saint-Vivant, Richebourg, Bonnes Mares, Mazis Chambertin and Chambertin. Overall, the 1999s are more rustic than their 2010 counterparts. Indeed, the average quality and consistency of the 1999s is a notch below the 2010s, as these wines make quite clear. In this flight, the standouts are the Mazis, the Chambertin and the Bonnes Mares, which is simply mindblowing. All six wines live up to the pedigree of this great vintage, with the exception of the Corton Renardes, which is a bit burly, even within the context of a site that tends to produce somewhat rustic Burgundies. Pressing the rewind button takes us to the next flight; the 1949 Corton Les Bressandes, Richebourg and Chambertin, along with the 1947 Romanée Saint-Vivant. We are in the post World War II period, when Burgundy was a far poorer region than it is today. The condition of these wines today is stunning given the lack of tools and knowledge that were available at the time. And yet, talented vignerons and winemakers clearly knew what they were doing. Here, I slightly prefer the 1949 Richebourg, a wine that only really blossoms with time in the glass. Even after nearly seventy years, the 1949 Richebourg conveys the power, energy and structure that are such signatures of this Vosne-Romanée Grand Cru. Amazingly, the 1937 Corton Clos du Roi, Romanée Saint-Vivant, Richebourg and Chambertin are all in great shape. A noble wine, the 1937 RSV is especially fine, with remarkable density and power for a wine of its age. I also adore the Chambertin for its sensuality and allure. With this flight, the red wine portion of the tasting comes to a resounding finish. In a word: superb. The 2010 whites in this flight are Meursault Les Narvaux, Corton Charlemagne and Chevalier-Montrachet, all of which are just as memorable as they were when I first tasted them a few years ago. The vintage is just as strong for whites as it is for the reds tasted earlier in the morning. At nearly eight years of age, the 2010s are only now starting to drink. Interestingly, Narvaux is among the vineyards that belonged to François Leroy when he founded Maison Leroy in 1868. Over the years, that parcel was inherited in succession by Joseph Leroy, Henri Leroy and finally Lalou Bize-Leroy, who then incorporated it into Domaine d’Auvenay. Even more importantly is the level of quality Lalou coaxes from Narvaux, which is classified as a humble village cru. The 2010 is simply magnificent. As for the Chevalier-Montrachet, well, it more than lives up to its pedigree and bearing. What a wine! 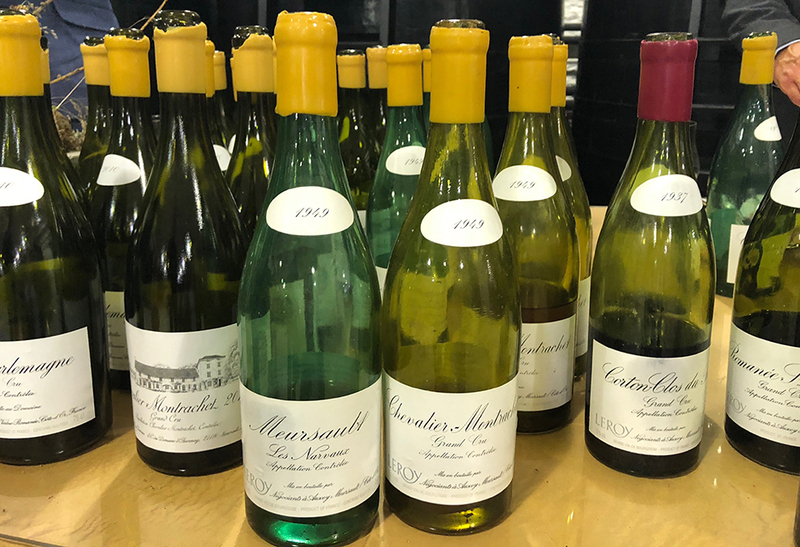 We enter another world entirely with the 1949 Meursault Les Narvaux and Chevalier-Montrachet. It is hard to fully do justice to wines that give the impression of being at their total peak of expression. How can that possibly be? The wines are nearly seventy years old. And yet there they are, in all of their resplendent glory. To say these are among the greatest wines I have ever tasted seems superficial. 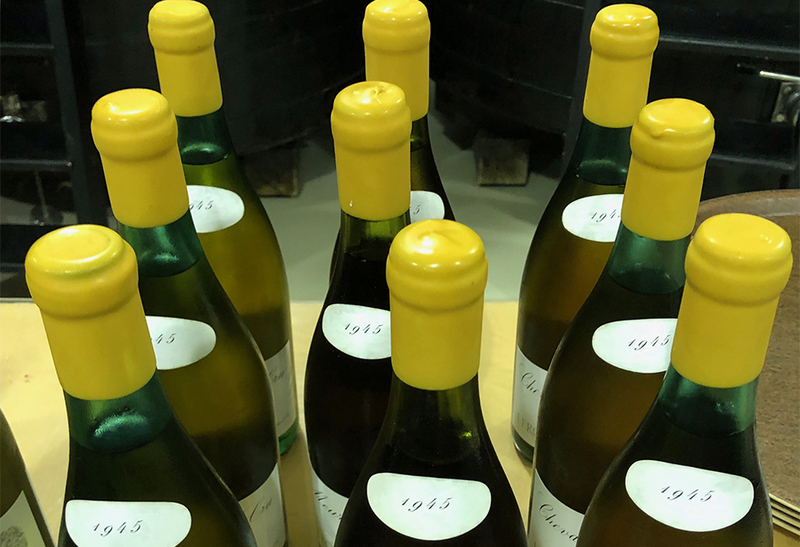 Three 1945 whites round out this mind-boggling selection of wines: Meursault Les Genevrières, Meursault Les Perrières and Chevalier-Montrachet. It is hard to contemplate today what must have been going on in these vineyards in the middle of the World War II and in the immediate aftermath. As for the wines, they are deeply moving. The Genevrières is my favorite wine in the flight, as it has the most energy, which I would have found hard to believe had I not tasted the 1964 a few years ago. The Chevalier-Montrachet is also quite good. Oily and voluptuous on the palate, the Chevalier is clearly fully mature, and yet it also has more than enough structure and balance to hold everything together. It is another truly remarkable wine. After the formal tasting was done, I had a chance to go back and revisit all of these wines, often from multiple bottles, with all the time in the world. My mind goes back to my first visit here, when the young 2006s were still in barrel, and what an amazing experience it was to taste through the entire range that day. Even after all these years, the Leroy wines offer a visceral thrill that is hard to describe with mere words, but witnessing their evolution over many decades is truly special. Today, we live in a highly globalized world. The latest and greatest smartphones dominate our lives, online shopping has wiped out entire segments of brick and more retail and renowned chefs operate in multiple continents. Fortunately, some things remain unique, small in scale and impossible to replicate. Lalou Bize-Leroy and her wines are true originals. Je me souviens encore de ma première visite au Domaine Leroy. C'était l'été 2007. Un de mes meilleurs amis de l’école de commerce allait se marier à Paris, ce qui a produit l'occasion idéale pour passer d’abord quelques jours en Bourgogne. A ce moment là, c'était beaucoup plus tôt dans ma carrière de dégustateur et d'écrivain. Honnêtement, j’ai eu tellement hâte à cette visite que j’ai eu du mal à me coucher la nuit précédente. Quelques années auparavant, j’ai goûté quelques-uns des grands crus de 1993 et les vins sont restés gravés dans ma mémoire depuis. En entrant dans la discrète cave à Vosne-Romanée, j'ai remarqué que les murs étaient couverts de photographies de ce qui ressemblait aux dégustations incroyables. Doucement adoucies par le temps, ces photos témoignent de l'héritage extraordinaire construit par Mme Lalou Bize-Leroy et son défunt mari, M. Marcel Bize, au cours des six décennies qu’ils ont passées ensemble. Mon esprit s'égarait en imaginant comment ce serait d'assister à l'un de ces événements. Je ne savais pas que dans les années à venir, j’aurais l’occasion de participer à plusieurs dégustations historiques au Domaine Leroy et aussi au Domaine d’Auvenay, le domaine et la résidence familiale de Mme Lalou Bize-Leroy situé dans les collines en dehors de Meursault. Connue tout simplement sous le nom de « Lalou », Mme Bize-Leroy reste l’une des figures les plus dominantes dans le monde du vin. Les lecteurs souhaitant en savoir plus sur son carrière extraordinaire peuvent relire cet article d’il y a quelques années. J'accepte très rarement des invitations aux dégustations à grande échelle aux domaines. La plupart de ces affaires sont manifestement des événements ou des soirées pour faire la publicité du domaine, ce que je trouve insupportablement ennuyeux et qui ne m’intéresse pas du tout. Mais les dégustations de Mme Bize-Leroy sont toujours différentes car elles sont avant tout historiques. Voudriez-vous savoir quelle était la chose la plus remarquable ce jour-là ? Pour moi, c'est que Lalou n'a fait aucun commentaire devant le groupe composé d'environ 40 personnes. Elle se promenait à chaque table de quatre invités, comme elle le fait toujours à ce genre d’occasion, et discutait avec eux, mais il n'y a pas eu de discours, ni de commentaire préparé et aucune discussion des vins. Chaque dégustateur a été emmené à sa place et on lui a donné quatre verres. À partir de ce moment, Messieurs Frédéric Roemer et Gilles A.C., des collègues de confiance de Mme Bize-Leroy, ont versé les vins sans aucune fanfare ni de cérémonie. Il s’agissait des vins. Et uniquement les vins. J'ai demandé à Lalou comment elle a élaboré le programme. Après tout, elle possède une cave remarquable de vieux millésimes sans égale en Bourgogne, voire ailleurs. Connaissant son souci du détail, je ne peux que me demander combien de bouteilles ont été ouvertes à l’avance pour vérifier si elles convenaient à cette dégustation. Je suis sûr que ce n’a pas été une petite quantité, vu que Mme Lalou Bize-Leroy n'est pas quelqu'un qui laisse le moindre détail au hasard. « Eh bien, je voulais commencer par 2010, ce qui est, à mon avis, un excellent millésime », a-t-elle admis. "Ensuite, je voulais voir ce que j'avais que je pourrais servir des mêmes vignobles de 1999 et 1949, pour couvrir deux autres grandes années, et puis terminer avec 1937 pour les rouges et 1945 pour les blancs", elle a ajouté avec une nonchalance désarmante, comme si elle décrivait des vins ordinaires que l’on pouvait avoir dans la maison. Cette informalité est une des qualités les plus précieuses de la culture bourguignonne actuelle, du moins chez les générations plus âgées. C’est un sentiment de simplicité lié aux racines artisanales d’une époque pas si lointaine où ces vins n’étaient pas l’objet de la spéculation et du désir qu’ils sont aujourd’hui. Je me considère très chanceux d'avoir pu être témoin de cette époque-là, car je ne suis pas sûr dans quelle mesure elle en restera pour les générations futures. En théorie, la dégustation a été conçue pour marquer les 150 ans du Domaine Leroy et sa 30ème année de l’emploi de l'agriculture biodynamique, cette dernière datant de l'époque où la biodynamie et le thème plus général de la durabilité en viticulture étaient à leurs balbutiements plutôt d’être considérés comme des concepts largement adoptés qu'ils sont aujourd'hui, mais il n'y avait aucune mention de l'une ou l'autre de ces étapes importantes. Les invités ont été attirés par de nombreux domaines et comprenaient le propriétaire de l'un des châteaux les plus prestigieux de Bordeaux, l'un des athlètes les plus réputés de France, plusieurs chefs renommés, quelques sommeliers, une poignée d'écrivains, un petit groupe de Takashimaya, le grand magasin japonais qui est copropriétaire du Domaine Leroy, quelques personnes avec des liens personnelles au domaine et d'un prince dont l’équipe de sécurité m’a repris la table habituelle la nuit précédente au Bistro de l'Hôtel de Beaune, ce qui a été plutôt drôle. Et voilà. Les vins des millésimes 2010 et 1999 ont été tous du Domaine Leroy ou du Domaine d’Auvenay, tandis que les vieux millésimes sont provenus tous de la Maison Leroy, l’étiquette négociant de la famille. Au fil des années, j’ai eu l’occasion de goûter et de boire de nombreux vins rouges plus âgés de Leroy, à la domaine et aussi ailleurs, je ne peux donc pas dire que j’ai été complètement surpris de la façon dont les vins se sont vieillis. Mais j'ai beaucoup moins d'expérience avec les blancs plus âgés de Leroy et c'est là que j'ai été vraiment captivé. Quand ils sont jeunes, les blancs de Leroy et d’Auvenay sont souvent très difficiles à lire parce qu’ils sont fortement réduits. Les 2010 sont actuellement au stade où la réduction a commencé à se dissiper. En remontant encore 11 ans en arrière, les 1999 commencent à être complètement expressifs. À une époque où les consommateurs sont terrifiés par l'idée de garder leurs blancs bourguignons plus que quelques années, Mme Lalou Bize-Leroy fait des vins blancs qui ne commencent à bien boire qu’à vingt ans. En ce qui concerne les années 1949 et 1945, ces vins sont de la magie pure. En 2014, Mme Bize-Leroy m'a servi un Meursault Genevrières 1964 qui reste toujours un des plus grands vins, blanc ou rouge, que j'ai jamais goûté. « Je ne sais pas pourquoi les gens sont si pressés aujourd'hui! » elle a crié avec son ton passionné qui me fait toujours sentir qu'elle est un peu (ou peut-être pas juste un peu) ennuyée. « Les vins ont besoin de temps. Les 1964 ne sont vraiment prêtes à boire que maintenant », m'a-t-elle dit ce jour-là. Qui étais-je pour discuter? Je n’étais même pas né au moment de de cette Genevières 1964 ou bien au moment de la sélection par Bize-Leroy de ce vin pour la gamme Maison Leroy. Pour toutes ses réussites, Mme Lalou Bize-Leroy reste une figure controversée en Bourgogne. Certains de ses collègues en veulent à elle pour son succès éclantant et pour sa personnalité franche et effrontée sans vergogne. D'autres frémissent devant les prix vertigineux que ses vins imposent sur le marché et leur niveau de rareté qui fait que très peu de gens ont la chance de les goûter. Mais tout le monde observe ce qu'elle fait dans les vignobles. La réalité, c’est que Mme Bize-Leroy élabore des vins uniques. Des rouges sont souvent envoûtants, alors que ses blancs sont peut-être encore plus aptes au vieillissement. Tout simplement, le monde du vin a besoin de plus, et pas moins, de voix fortes et éloquentes. Mme Lalou Bize-Leroy incarne de nombreux idéaux, mais elle est sans conteste le plus grand représentant de la Bourgogne du concept le plus essentiel de la région: le terroir. En d'autres termes, c’est l'idée qu'un vin doit avant tout exprimer un sens de lieu. La dégustation commence avec six grand crus du millésime 2010 : Corton Renardes, Romanée Saint-Vivant, Richebourg, Bonnes Mares, Mazis Chambertin et Chambertin. Je reconnais que j’ai toujours eu un faible pour 2010. C’est l’année de naissance de ma fille, et aussi un millésime que j’ai goûté ici en fûts et ensuite en bouteille lorsque j’étais au Wine Advocate. Les vins ont toujours été marqués par une pureté, une énergie et une structure extraordinaires. À l'époque, le Mazis 2010 était un vin qui m’a laissé avec des jambes en coton. C'est tout aussi palpitant aujourd'hui. Le Chambertin est une autre étoile dans ce groupement. Un vin sans commencement ni fin, le Chambertin est d'une beauté scandaleuse. Le Corton Renardes est un autre vin positivement brillant. Bien qu’il n’ait pas le prestige supposé des crus des Côtes de Nuits, le Corton Renardes est un vin que j’apprécie souvent pour sa structure et sa puissance. Il y en a beaucoup aujourd'hui. Lalou répète les mêmes vins à partir de 2010 avec une série de 1999 : Corton Renardes, Romanée Saint-Vivant, Richebourg, Bonnes Mares, Mazis Chambertin et Chambertin. Dans l’ensemble, les 1999 sont plus rustiques que leurs équivalents de 2010. En effet, la qualité et la consistance moyennes des 1999 sont légèrement inférieures à celles des 2010, ce que ces vins rendent plutôt évident. Parmi ces vins, les vedettes sont les Mazis, le Chambertin et les Bonnes Mares, qui sont tout simplement époustouflantes. Les six vins respectent le pedigree de ce grand millésime, à l'exception du Corton Renardes, qui est un peu costaud, même dans le contexte d'un site qui tend à produire des bourgognes quelque peu rustiques. En appuyant sur le bouton de rembobinage, se rend à la troisième série de la dégustation : les Corton Les Bressandes, Richebourg et Chambertin de 1949, ainsi que la Romanée Saint-Vivant de 1947. Nous sommes dans l’après-guerre, lorsque la Bourgogne était une région beaucoup plus pauvre qu’aujourd’hui. L'état actuel de ces vins est époustouflant vu le manque d'outils et d’informations disponibles à l'époque. Et pourtant, les vignerons talentueux savaient très bien quoi faire. Ici, je préfère légèrement le Richebourg de 1949, un vin qui ne fleurit vraiment qu’avec le temps passé dans le verre. Même après près de soixante-dix ans, le Richebourg de 1949 transmet le pouvoir, l’énergie et la structure qui caractérisent si bien ce grand cru de Vosne-Romanée. Étonnamment, les 1937 de Corton Clos du Roi, Romanée Saint-Vivant, Richebourg et Chambertin sont tous en très bon état. Un vin noble, le 1937 Romanée Saint-Vivant est particulièrement fin, avec une densité et une puissance remarquables pour un vin de son âge. J'adore aussi le Chambertin pour sa sensualité et son allure. Avec cette série, la partie vin rouge de la dégustation se termine de manière éclatante. En un mot : superbe. Ces Blancs de 2010 sont Meursault Les Narvaux, Corton Charlemagne et Chevalier-Montrachet, tous aussi mémorables que lorsque je les ai goûtés pour la première fois il y a quelques années. Le millésime est aussi fort pour les blancs que pour les rouges que j’ai dégustés plus tôt dans la matinée. À presque huit ans, les 2010 commencent seulement à boire, mais ils ne sont pas pleinement prêts. Il est intéressant de noter que Narvaux fait partie des vignobles qui appartenaient à François Leroy lors de la fondation de la Maison Leroy en 1868. Au fil des années, cette parcelle a été héritée successivement de M Joseph Leroy, M Henri Leroy et enfin Mme Lalou Bize-Leroy, qui l'a ensuite intégrée au Domaine d’Auvenay. Plus important encore est le niveau de qualité du Narvaux, qui est classé comme un humble cru villages. Le 2010 est tout simplement magnifique. Quant au Chevalier-Montrachet, eh bien, il est à la hauteur de son pedigree et de sa réputation. Quel vin ! Nous entrons entièrement dans un autre monde avec les Meursault Les Narvaux et Chevalier-Montrachet de 1949. Il est difficile de rendre justice entièrement aux vins qui donnent l’impression d’être à leur maximum d’expression. Comment est-ce possible ? Les vins ont presque soixante-dix ans. Et pourtant, ils sont là, dans toute leur splendeur resplendissante. Dire que ces vins comptent parmi les plus grands vins que j’ai jamais goûtés semble superficiel. Trois vins blancs de 1945 complètent cette sélection hallucinante de vins : Meursault Les Genevrières, Meursault Les Perrières et Chevalier-Montrachet. Il est difficile d’envisager aujourd’hui ce qui se passait dans ces vignobles pendant la Seconde Guerre mondiale et tout de suite après. Quant aux vins, ils sont profondément émouvants. Le Genevrières est mon vin préféré dans ce groupement, car il a le plus d’énergie, ce que j’aurais eu du mal à croire si je n’avais pas goûté le 1964, il y a quelques années. Le Chevalier-Montrachet est également très bon. Gras et voluptueux en bouche, le Chevalier est clairement bien mûr, mais il a aussi plus que suffisamment de structure et d'équilibre pour tout maintenir en place. C'est un autre vin vraiment remarquable. Une fois la dégustation formelle terminée, j'ai eu l'occasion de revenir en arrière et de revisiter tous ces vins, souvent issus de plusieurs bouteilles, avec tout le temps du monde. Je pense à ma première visite ici, lorsque les jeunes de 2006 étaient encore en fûts, et quelle expérience incroyable ce fut de goûter à toute la gamme ce jour-là. Même après toutes ces années, les vins Leroy offrent un frisson viscéral difficile à décrire avec de simples mots, mais assister à leur évolution sur plusieurs décennies est vraiment spécial. Aujourd'hui, nous vivons dans un monde fortement globalisé. Les derniers grands smartphones dominent nos vies, les achats en ligne ont effacé des segments entiers du commerce et de chefs renommés opèrent sur plusieurs continents. Heureusement, certaines choses restent uniques, de petite taille et impossibles à reproduire. Mme Lalou Bize-Leroy et ses vins sont de véritables originaux. Des remerciements spéciaux à ma mère, Nanette, pour m'avoir fait suivre quatre années de français au lycée et à mon assistante de direction, Samantha Potter, pour son aide à traduire.